1. TODD-AO for Altiverb 6 and Logic 8. 2. Logic 8, Starship Farragut mix. 3. Older Template for Logic 7 and none Altiverb users. 4. John Frizzells VI Template. These templates are purely for learning purposes and Hetoreyn does by no means say that these will solve all your mix problems. However you may find them useful to understand how to mix your own orchestral pieces. We do hope that you find them useful. The VSL Podcast and Hetoreyn’s templates are created and distributed by me, absolutely free of charge. 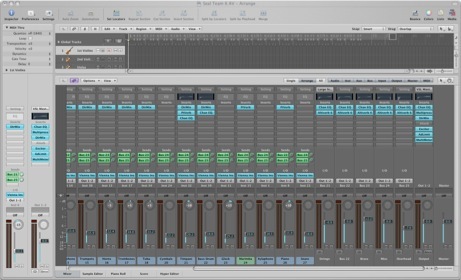 TODD-AO Room Template for Logic 8, Altiverb 6 & VSL VI Special Edition. Altiverb 6 and TODD AO IR's required for this Mix Template. Also it is recommended that you use this on a computer greater than a Quad G5. 5 Instances of Altiverb are required so it is quite CPU intensive. So first things first. Please download this Logic 8 Template. This has also be made with the Vienna Instruments - Special Edition Package in mind. Of course you can use any sample library, just assign which instruments you wish to use in the appropriate tracks. Now then, I'd best explain a little about this. Hopefully all the presets for the EQ, and Dir-Mix plugs will work fine for you as they should be contained within the template. Please feel free to e-mail me if they don't. However I believe they will be fine. If you do not have Logic 8 but wish to try these settings in Altiverb then here are the Altiverb Presets for Audio Units. Now before you go off and try this you may wanna stick around and read about the setup which is fairly complicated, but easy enough once you're aware of how it works. So basically this uses the idea of reverb on bus send and returns. So there are 4 instances of Altiverb, each with it's own depth preset and in some cases a different IR (Impulse response) within the TODD AO set. And there is another instance which is used as a kind of overhead "Room Sound" reverb. You need to use them all to really get the proper simulation. Those of you with a Mac Pro will probably be okay but I'm sorry to say that others with lesser machines (Like myself :P) may struggle. However .. bouncing offline of songs works fine. For those who don't have 8 Core power, or Altiverb you can of course try my other template which is a little less power hungry. (See Topic 2 & 3). So, you can see here the end portion of the mixer which shows you some of the routing. As you see all the channels send there signal to Bus 25 which is the "Overhead" instance, and also send the signal to one of the 4 depth instances too. There maybe a way to do this without having to use 5 instances, but I have tried for a while now and still this has the best sound out of all my tests. If you wish to have less room sound .. and thus less reverb it is best to take down the "Overhead" fader as this reduces overall reverb. Also you will note a bypassed 'AVerb' on the Master Output channel. this is intended as a place holder for an artificial reverb if you want to add more. the reason being that sound stages also add reverb to their recordings since they have a fairly dry sound. Although this template has plenty of room sound you may sometimes want to add more. So that's why that is there. Okay so you've taken a look at the Altiverb pics and you're probably wondering why there's no direct signal. Well in this case it's off 'cos we're using it as send / return .. so no direct signal, and no need to worry about IR colour. You'll also note that I've made use of the dampening settings, it's taken me a long time to get this hall sound balanced, and removing the mudd at the low end is really crucial or you just end up with a super boomy sound. I've also used some bass roll off on the Altiverb EQ. Heres a pic. So how does depth work? Well in this case the bus sends .. on the instruments tracks .. are set to pre-fade .. which means that the fader for each instrument is now acting as a depth control instead of volume. so you can set your instruments back or forwards. And assign them to different Altiverb depths if need be. Now the bigger question you're asking yourself is "How do I control the volume then?". Well in this case I tend to use a mixture of velocity crossfade and expression control. The expression control on the VI (Vienna Instruments) player allows you auto-mateable control over the volume and velocity which is easily edited from the Breath or Expression controller panel on the piano roll. In this case the bass end has been taken down by -6dB. You can change this .. or anything if you like .. but I find it helps to again take out the 'boom' in this IR set. I hope it works for you. I have made a piece using this template, although I admit it got annoying having so many audio drop outs near to the end when the piece got pretty full up, but I managed and the bouncing offline worked fine. It maybe a power hog, this template, but it has a very realistic sound quality to it, and I think it's so far one of my favourite templates. It may even work best as a Multitrack audio template but I'll leave it to you to make that template. This is the Template the I used to make the soundtrack to Starship Farragut. The basic setup is fairly simple. All linear routing until we get to the reverb busses. The Aux's are being used to send / return the signals to the reverb depths. If you wish to increase or lower the ambient reverb then use the Space Designer / Altiverb Reverb fader. You can choose between Space Designer or Altiverb depending on what you wish to use. Again being a Logic 8 template all the presets and files should be contained within the file. You may already have a Space Designer and Dir Mix folder so you'll have to put the contents of these downloaded folders into your existing folders. And then when you load up Logic they should be ready to go. I have turned off all the EXS instances though I have kept the tracks there so it's very easy to follow the routing if you wish to use the instrument template as well. The routing is very simple and rather linear. Good Luck. 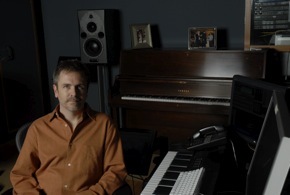 Here is a Logic Environment template that Hollywood composer John Frizzell has graciously donated to the VSL Podcast. This was made by John and his assistant Frederik Wiedmann and is designed for use with the Vienna Instruments (VI) Strings I and II, (Full editions). The file is a zip and also contains a read-me file which will give some help on what the environment does. This all ties in to what was talked about on show 38. Also there is an Interview with John Frizzell on show 38, (also available from the Interview Download Archive). *Thanks to John and Frederik for allowing me to host this file on this site.